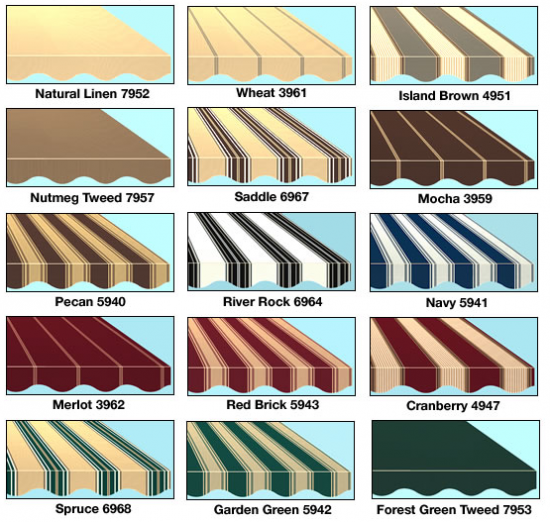 Below review the colors we offer in two fabric types: Woven Acrylic Fabric, and Laminated Fabric. Woven Acrylic Fabric: Our elegant Woven Acrylic Fabric is a highly durable yet lightweight fabric with a beautiful, textured look and feel. It’s water-repellent and 100% solution dyed, so the color goes all the way through the fabric and resists fading. Because our acrylic fabric is woven strand by strand, it lets us create an extensive selection of exceptional, rich, warm vertical stripes and solid colors not available otherwise. Laminated Fabric: Our Traditional Laminated Fabric is a heavy-duty, 100% waterproof, 5-layer fabric that features 2 thick color pigmentation layers, an inner scrim layer for strength, and two layers of clear coating top and bottom. The protective coating lets the fabric stand up to UV rays and wear and tear.